The thumbnail linky seemed to be a hit, but some of you still liked the old style. This week I ask that you choose only one so that I can get a better idea of preferences. Thanks. I'm so excited that I am #1! I'm so happy that your kids are doing so well in the water! wow, how did you get that shot!? Perfect! our pics are similar this week. more pride in the fear of overcoming the fear of water. sigh....life is GREAT! great under the water shot! I like either or both. Usually I prefer the thumbnail, but for some Wordless Wednesdays it kind of spoils the surprise. Love, love, love this picture! I love underwater pics they are so cool. And, great at overcoming the phobia. thanks for getting me started with WW - i look forward to it every week now. A camera with underwater capabilities opens up a view into an entirely new watery realm. Awesome! Awesome shot, Alicia! It makes me want to go swimming and even dunk my head under! that is a superb picture! Love this photo, but I confess I feel like this sometimes when I'm nowhere near water! Awesome! What camera did you use for doing underwater? Great photo! And kids getting over their fear of water is awesome! Princess has gained so much confidence in the pool this year and her excitement when near the water is just so contagious! this photo helps me feel cool! my grandsons love the water. the older one is afraid this year to go in the deeper water, he had surgery earlier this year. I like either way of posting.. since I may have more than one photo. have a great week! Fantastic photo. It is great when they start to overcome their fears. Oh that picture is nice! It makes me want to go swimming right now! Fun shot..but I love the FRAME! Is that weird? LOL. Thanks for the WW! Very cool picture!!! 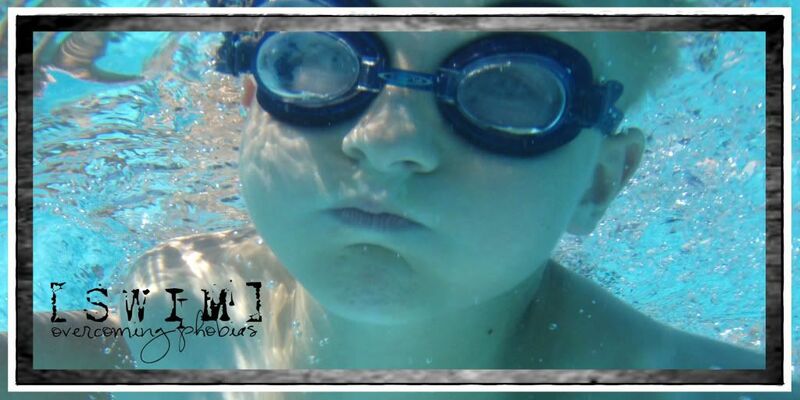 Got to love underwater cameras!! Thanks for having us again. I must look into getting an underwater camera-what possibilities! Hmmm...I tried to link this week...didn't work? Wonder what I am doing. Beautiful picture though, you are amazing! oooh yes, I figured it out! It looks like he's totally phobia-free. Great news. Wow, what a great shot! Happy WW! that's a beautiful shot for WW. That is am amazing picture! Phobias are always a challenge to overcome but it seems so easy in your picture. Well he looks like a regular fish. Great Picture. That's neat! Wish I could take underwater shots. Not that I'm ever under water, but maybe I'd make it more of a priority if I could take pictures while I'm down there! I used to be afraid of water because when I just started swimming, I got choke and went through a drowning experience. And I was not a good swimmer. Until a point of time when a friend shared that he was doing laps in the pool every time he went swimming. That got me thinking if I could do it too. Eventually I challenged myself; from barely able to complete a lap, I eventually finished 100 laps at one go. Really cool, Alicia! Happy Wednesday! Your WW post is perfect. Love it! Re: Linkies - I prefer this one with your photo and the thumbnails, but I had already posted at the other - there was no note there that this was available (hence my comment there asking who was hosting this). Of course, I thought of my own phobias and worried there'd be another spider picture. :) But glad to see a face bravely in the water! you have the most popular linky in town! That is a good phobia to overcome at a young age. Not a panicky look at all. Umm... color me IMPRESSED! That's an incredible shot-- I just love it! Fear of water or goggles? What a beautiful WW shot here! Very very brave! Looks like he has done it! P.S. I loved swimming when I was a kid. Is he nervous of the water or just of going under?? Good for him either way!! Great photo! This reminds me that I still need to find a place to bring my older son for swim lessons. Wow! That is a great photo! We are working on overcoming the same fears here! Wonderful shot! I've done the word"ful" Wednesday this week, but I'll still add myself to the linky. I need a camera where I can take underwater pictures. What did you use? That is an awesome shot! Wow! That is an impressive shot!!! I like the ones with photos instead of the plain list. I tried to linky on mah phone, not workin. yay for growth and new adventures! Love the photo, i so wish my camera could take underwater photos!! Nice photo! Looks like he is doing a great job overcoming his fear! Wow, what an expressive shot. You must have a great camera (aside from your amazing skills of course) to get a wonderful underwater photo like that. What a great shot! That's so wonderful they are conquering their phobias! Great shot!! I love underwater cameras and I have always wanted one. Perfect summertime pic. Black and whites have always been my favorite. There's a sense of mystery to the shots whereas with color, it's all spelled out for you.